NEW CITY, NY – – Rockland County Executive Ed Day and County Health Commissioner Dr. Patricia Schnabel Ruppert encourage residents six months and older to get a free measles, mumps, rubella (MMR) vaccine on Friday, April 12, from 1:00 pm to 3:00 pm at the Monsey WIC office, located at 23 Robert Pitt Drive, Suite 103 in Monsey, NY 10952. “With the measles outbreak continuing in Rockland County, now with 173 confirmed reported cases, the best way to help protect yourself and the community is to remain up-to-date with your measles vaccination,” said Dr. Ruppert. 18,173 MMR vaccinations have been given as of April 9, 2019. In addition, MMR vaccines are available at local health care providers or by calling a local federally qualified health center, such as Refuah or Hudson River Health Care. The federally qualified health centers see patients on a sliding fee scale and by appointment. They may require patients new to their centers to have a well visit first, before a vaccine can be given. Visit www.nachc.org/about/about-our-health-centers/find-a-health-center/ to find the locations of federally qualified health centers in Rockland. The Health Department is actively working to contain the further spread of measles. As a result, if you are ill with a fever, rash, or conjunctivitis (red watery eyes) – help protect our community by staying home, not having visitors, and not going out in public. To further prevent the spread of illness, the Department is advising individuals who have symptoms consistent with measles to contact their health care provider, a local clinic, or a local emergency department before going for care. This will help to prevent others at these facilities from being exposed to the illness. The Health Department is asking all health care providers to immediately report all cases of suspect measles to the Rockland County Department of Health Communicable Disease Program staff by calling (845) 364-2997 during normal business hours, or (845) 364-8600 after hours/weekends. Health Care Providers can also call this number for additional information. 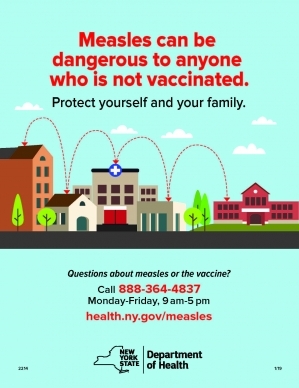 Residents can get more information about measles by visiting https://bit.ly/2zh4v1G and by calling the New York State Department of Health toll free Measles Information Line at (888) 364-4837.